I am rushing through the streets of Delhi trying to find Karim’s. My red and yellow patterned shalwar kameez bought from an overpriced boutique store in Delhi’s shopping district, Connaught Place in Rajiv Chowk, flaps in the breeze as I get progressively more lost. “This better be good!” I mutter to myself as I ask passersby for directions in Hindi. Inspired by rave reviews from Indian friends, I decided to spend my last day in India in hot pursuit of this impossible-to-find restaurant in the heart of the Muslim quarter of Delhi, India’s capital. I am led through a maze of alleys and the imposing and historic Jama Masgid just as the faithful are being called to prayer. I stay, admiring the beauty of the red stone mosque, until the throngs gradually spill out onto the streets. The Jama Masgid, built by the Mughal emperor Shah Jehan in the 16th century, boasts an impressive courtyard with a central water pool where believers wash before prayer. Tourists and families lounge and relax in the courtyard, underneath grand arches and minarets towering into eternity. It is these identical three-way arches which get confusing as I am trying to remember which one I came from and which one to exit from. I am told Karim’s is down the stairs through an alley from the left arch. I take a deep breath, becoming more alarmed as night descends on the city, wondering if I should go back. Motivated by gluttony, I decide to trek out. Finally, I’m here. It was much closer than I expected. Karim’s is tucked away in an alleyway adjacent to the mosque, unremarkable except for its spectacular food. I find it is inhabited entirely by locals. The back of the menu boasts a review by Time magazine listing it as one of the best restaurants in Asia. In India, many restaurants specialise in either vegetarian or non-vegetarian food. I had already tasted some sublime vegetarian options and am keen to try some meat. As a family business Karim’s offers a range of traditional Mughal-style meat dishes including seekh kebab, haleem, tandoori chicken and classic biryani, from recipes passed along generations. I try the mutton biryani, seekh kebab with hot toasted naan and a small dish of yoghurt to cool down the meal. I am in heaven; the food is hot, tasty, crisp and sublimely fresh and unadorned. The restaurant though, sparse and simple, is bustling. 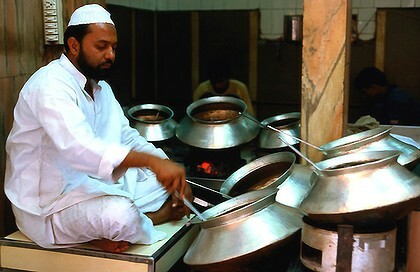 Nearby, men with giant wooden spoons mix stews in large fragrant pots and the smell of sizzling meats from hot tandoor ovens wafts in. The service is prompt and the environment clean. I am flabbergasted by the bill. A fraction of what I have been paying in hotels. Not only is the food among India’s most delicious, it’s also among its best-value, and and well worth the trouble of getting lost. Next Post Pakistan’s traditional spirituality hijacked?